Callahan’s Lodge and Restaurant, just off of Interstate 5, was going to be my home for the night. To reach it from the trail, I had to walk a frontage road until I came to an underpass that went under the freeway. As I walked along, a car pulled alongside of me and the friendly driver asked if he could give me a lift. I told him I was headed for Callahan’s and he said that’s where he was going. I accepted the ride and in the course of our short conversation, I ascertain that my host was Ron Bergquist, the owner of Callahan’s. He was just returning from shuttling a thru-hiker back to the trailhead. As we made the short drive to the lodge, Ron explained to me the hiker package the lodge has for hikers who want to spend the night. The package included tenting on the lawn at the back of the lodge, an all-you-can-eat dinner and breakfast, plus the use of laundry and shower facilities – the cost: fifty dollars. Other overnight options included hitching into Ashland and staying at a KOA campground or a hostel. I chose the lodge, and considered it one of the best choices for lodging on the entire Pacific Crest Trail. It was a place I would definitely come back to. After Ron let me off in the parking lot of the lodge, I checked in at the front desk, retrieved my resupply package, and was presented with a towel and terry cloth bathrobe for the shower. On the back lawn, I found other hikers already camped - Lucky Man, Wight, Dora the Explorer, Spitfire, and Geared Up. Eventually, Feather, Swiss Army, Wendy, Shorts, Storytime, and Wall-E would also show up. I needed new sunglasses and a rain cover for my backpack, which I knew I could purchase at the Outdoor Store in Ashland – nine miles to the west on Highway 5. I made a cardboard sign that simply said PCT hiker/Ashland and positioned myself on the freeway next to the on-ramp. Cars and trucks went whizzing past at 70 miles per hour, and I had faint hope that one would be moved upon to slam on their brakes, pull out of the fast lane and into the slow lane, to offer me a ride into Ashland. After an hour’s wait, and not so much as even a hint of a ride, a vehicle coming up the on-ramp stopped and offered me a ride. I told the driver my destination, and he said he knew exactly where it is and would drop me off there. Once in town, he was kind enough to drive me by the main grocery stores in case I needed provisions. After making my purchases at the Outdoor Store, I returned to the street leading out of town and commenced hitchhiking. Across the street, approaching from the opposite direction, I saw three homeless bums checking out the storefronts – it was Veggie, with his raggedy torn shirt, Track Meat, and Ole’. I could tell they were looking for the Outdoor Store; I caught Track Meat’s eye and pointed to the store, which was around the corner from where they’re standing. He gave me a thumbs-up and moved on. After a half hour’s wait, a single woman driving an early model car stopped beside me and offered a ride. She asked if I was a PCT hiker and I told her “Yes,” and added that I was staying at Callahan's Lodge, in hopes that she might be willing to give me a ride that far, which would really be going out of her way. To my surprise, she offered to drive me to Callahan’s. Now I got bold and asked if she would be willing to first stop at the grocery store on the way out of town so I could pick up a few supplies; to this, she also readily agreed, saying that she also needed to stop at the same store. As we drove out of town, we talked, and in her conversation, I detected a hint of an accent when she spoke; when asked about it, she said she was from Switzerland; she worked as a massage therapist; her name was Dominic, and she was fifty-six years old. I found all this out in the length of one city block. We were both in and out of the grocery store in a matter of minutes, but I noticed that while we were in the store, she was greeted by a number of people. Apparently Dominic is well known in the community or she just happened to meet several of her clients in the store. Dominic was gregarious and we chatted amicably as we journeyed east towards Callahan’s. 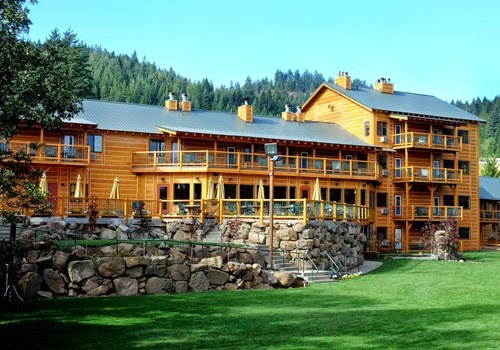 She informed me that the establishment was a new one, after the original Callahan’s Lodge was condemned by the state in 1964 to acquire a right-of-way for the new Interstate 5. As we talk, I couldn’t help but notice Dominic’s face. She might be fifty-six, but her skin appeared to be as soft and supple as a baby’s bottom; there was not the slightest hint of a wrinkle in her face. I wanted to comment about it, to ask what she attributed the extraordinary beauty of her skin – a lotion maybe, but by now, we were in the parking lot. I thanked her for her kindness and generosity in bringing me all the way to Callahan’s, which I knew was going the extra mile. Dinner this evening was pleasant; it was an all-you-could-eat spaghetti dinner, and seated at the table with me were Storytime and Swiss Army. For dessert, I ordered a large chocolate milk shake, and then topped that off with a traditional chocolate mousse – a specialty of the house. After dinner, I finished sorting through my resupply box and repacking my backpack. I had a number of food items that I left in the hiker box, but thanks to Swiss Army, I was now carrying a six-pack of bagels, two tubs of flavored cream cheese, a large package each of Swiss cheese, and dry sliced salami. It was my intention to eat well during the next week on the trail. Before calling it a day, I reconfirmed with Ron, the lodge owner, about his offer to provide a shuttle to several of us back to the trail tomorrow morning. He assured me he would be available. Camped on the back lawn with me was a PCT hiker named Wight. When asked about his profession, he said he was the attorney general for the state of Georgia, and when questioned further about the types of cases he prosecuted, he said mostly mass murders. Well, that answer got my attention. He went on to explain that whenever more than one homicide was involved, which was often the case in gang-related murders, the state of Georgia designates him to oversee the legal proceedings of the case. I slept in this morning, as I knew I wouldn’t be leaving early; I didn’t want to miss the all-you-can-eat breakfast. Besides, I had already paid for it. Breakfast was pancakes, eggs, bacon, and toast. I stuffed away at least three helpings of short stacks, each with three cakes to a serving. My appetite is enormous; I eat everything in sight, and I have still lost forty pounds. When I view myself in a bathroom mirror, I see nothing but a sack of bones; there is no fat at all on my body. Because of what I ate for breakfast this morning, I felt confident I could have won the pancake challenge back at the Seiad Valley Café. There were four hikers who would be going with Ron this morning, and when we were all ready, we assembled at the front door of the lodge. Ron backed his SUV out of his parking stall in front of the lodge and stopped in front of us. The trunk lid popped open and we stuffed our packs into it, and then settled ourselves inside the car for the short ride to the trailhead. Looking down on Callahan's Resort. One of the best overnights along the trail. Callahan Resort from the backside. Hikers were allowed to camp on the lawn. That i look at merely a good bag for bone; there isn't unwanted fat in anyway regarding my best body system. By reason of what precisely That i dined meant for lunchtime this morning, That i were feeling certain I should have own triumphed in any pancake difficulty to come back within the Seiad Pit Café.